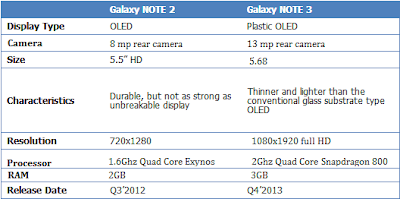 Android Revolution | Mobile Device Technologies: Is the Samsung Galaxy Note 3 worth upgrading from the Note 2? 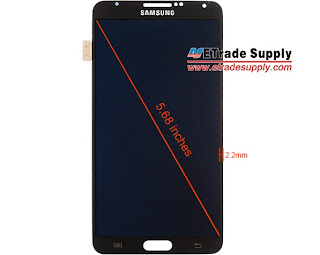 Is the Samsung Galaxy Note 3 worth upgrading from the Note 2? The Samsung Galaxy Note 2 transcends niche markets. With the original release of the Galaxy Note, Samsung released a device that didn't appeal to the mass consumer base. With it came insults about its size, with people going as far as to call it a "VCR". One year after its original release, the Note 2 was announced. With LeBron James as the face of the handset, its popularity rose to new heights. The phone that was once dubbed "too big" has now become the ideal device for many average consumers. With the Galaxy Note 3 nearing its release, we answer the question, is it worth upgrading from the Note 2 to the Note 3? Let's find out. Both devices sport a large, gorgeous display. The Note 2 operates on Samsung's trademark Super AMOLED technology, with a 5.5 inch 720 x 1280 screen, rendering 267 PPI (Pixels Per Inch). The quality is outstanding, with vibrant high contrast colour saturation. Since not all Super AMOLED displays are created equal, you may still end up with a blue or yellow tint. Eventually, your eyes will become accustomed to the screen given how stunning it truly is. The Galaxy Note 3 is set to be announced on September 4 in Berlin. The handset will sport a 5.7 inch 1080p Super AMOLED display. The U.S., U.K. and International versions may come with different screen technology. While the U.S.A. and United Kingdom will likely see the Super AMOLED version, other International markets will sport an LCD iteration. Regardless, both versions will have 1080p displays rendering upwards of 380 to 400 pixels per inch. With both screens offering a comprehensive and enjoyable experience, you really can't go wrong with either. The question is, is it worth the upgrade? Going from 267 PPI to nearly 400 PPI is noticeable by any measure. If you compare the Note 2 with the Galaxy S4, which sports 441 PPI, you will notice a difference in clarity and sharpness. The same could be said for the Note 2 and upcoming Note 3. The 1080p resolution displays are the real deal and until you have owned one, you won't fully understand the benefits. On a 5.7 inch screen, the Note 3 will render text and images crystal clear. This isn't a knock on the Note 2, but in comparison, there is definite value to upgrade just on the screen quality alone. In terms of hardware, both handsets provide thin frames without much bulk or weight. The Note 2 is 9.4 mm in thickness, while the Note 3 is rumoured to be somewhere in the range of the Galaxy S4, which is 7.9 mm respectively. Regardless, both are thin, and if you have ever held a Galaxy S4 in your hand, the device feels natural and extremely lightweight. If the Note 3 comes in metal casing, expect a better build quality over the all plastic Note 2. Both have removable back plates and batteries with micro-SD card slots. This is useful for accessories like flip covers. If you're a power user, you also have the option of carrying around an extra battery. Though with batteries powered at over 3,100 mAh, you will rarely need to charge your device on a regular basis, no less replace the battery. This is where the Note 2 shines the most, as the battery life is considered phenomenal by any stretch. The Note 3 is rumoured to have a larger battery, though will be more power intensive with a high quality display. We expect similar battery lives on both devices, which if the Note 2 is any indication, isn't a bad thing. The Note 2 is no slouch when it comes to specs. With a 1.6 GHz quad core Cortex A-9 Exynos 4412 CPU and Mali 400MP GPU with 2 GB of RAM, speed is rarely an issue. The Note 2 was actually one of the original quad-core handsets to be released in the US, and still out performs many phones to date. The Note 3 will also sport a quad-core processor, clocked at over 2 GHz with a Snapdragon 800 SoC and 3 GB of RAM memory, with rumours of a quad-core Exynos variation for International models. 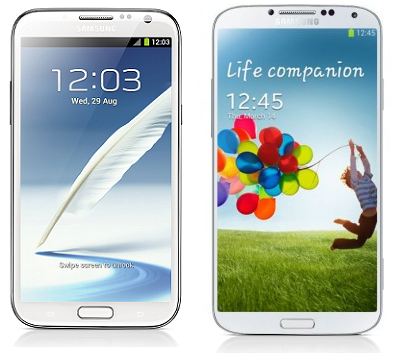 If we were to base these two phones on benchmark scores, the Note 3 would be the obvious winner. Flashing custom ROM's and development are available in a wide variety of options for the Note 2. The Note 3 will likely see the same type of development. If you're nit picky about speed, then you will likely notice differences with the two handsets. In terms of multi tasking and other power intensive processes, the Note 3 will withstand anything you throw in its way. The Note 2 at times shows signs of slow down, which could be eradicated with custom ROM's. For the average consumer, the difference may be minimal, but for the tech savvy smartphone user, the Note 3's future proof specs reign supreme. Note 2 are still waiting for the 4.2.2 update, which is a shame, since its been out for over a year now. The software is very similar to the Galaxy S3's version of TouchWiz except with optimization of the stylus. With it, you have the ability to operate features like air gestures, memo pad, among other things. The Note 3 will likely come with Android Jelly Bean 4.2.2 out of the box with the option to upgrade to 4.3. You will receive similar features found on the Galaxy S4 such as air view, air scrolling, smart scrolling, and other S Pen functionality. 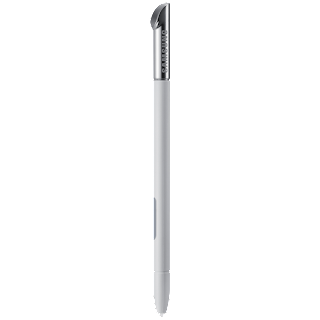 We are interested to see what Samsung has up their sleeve for the Note 3's S Pen optimization. Most stock ROM's for the Note 2 do not include use of the S Pen. There are however a few exceptions, as you can research specific stock ROM's which do utilize the stylus. Samsung will likely demonstrate their next generation S Pen when announcing the Note 3. How it will operate with the system is yet to be determined, but we would venture to think it isn't all that different from the Note 2, which offers a great experience. The Note 2 has seen an extraordinary amount of solid development in relation to ROM's, kernel's and more. Most of the builds and tweaks available for the handset are stable. With the imminent popularity of the Note 3, developers will line up to build solid ROM's, kernel's and other development for an even more comprehensive experience. The Note 3 will have more available features out of the box, and developers will take full advantage when optimizing fresh and unique builds. The ideas will flow and the growing community will continue to flourish. The rear camera on the Note 2 is an 8 MP shooter with a 1.9 MP front facing cam. The Note 3 will likely sport a 13 MP rear camera with OIS (Optical Image Stabilization) with a 2.1 MP front facing camera. The Note 2 was an evolution of the Galaxy S3, with similar camera technology. The Note 3 is naturally an evolution of the Galaxy S4, which comes loaded with a 13 mega-pixel camera. Comparing them is no easy task, as they both provide solid experiences for all of your photography needs. On the camera software end, the Note 3 will be similar to the S4's offering, with dual picture and video recording and an array of features. With a higher resolution display and higher mega-pixel count, the Note 3 is clearly the winner in the camera department. If your smartphone camera is important to you and is used for your day to day photo taking needs, the difference may well in fact be worth the upgrade. Samsung has saturated the market with their Galaxy line of handsets. The Note 2 is no exception, available for Verizon, AT&T, and T-Mobile in the US. The resale value of the Note 2 remains high, upwards of $480 in many cases. On contract however, you will still fork over anywhere between $99 to $199 depending on the model and retailer you purchase from. When originally released, the Note 2 was upwards of $299 on contract, and we expect the Note 3 to run about the same in pricing. T-Mobile offers their off contract pricing, which will likely see prices upwards of $199 down and $20 a month for 24 months on finance. The Note 3 will likely be available on all carriers in different variants by the end of September or as late as early October. Because it will be available on nearly every major carrier, it gets the edge in availability. 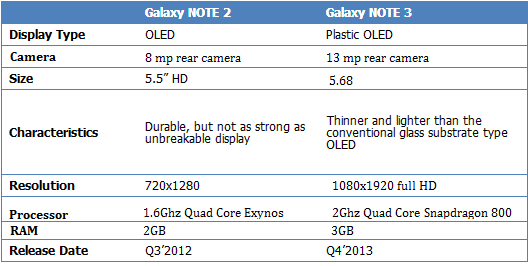 In terms of pricing, the Note 2 will be fire sold by the time the Note 3 is released. It will be a great buy for those looking to save money and believe the Note 2 offers enough bang for their buck. The UK will likely receive the Note 3 before the US, as this has been the trend with Samsung handsets for a few years. The Note 1 was released internationally six months before it hit the states. The Note 2 saw similar release trends and the Note 3 will likely follow. The Samsung Galaxy Note 2 changed the way we utilize our smartphone. With a 5.5 inch display, other handsets feel too small in comparison. Those who own the Note 2 swear by it, and they have valid reasoning. The Note 3 will be no exception, it will sell in record numbers and provide an even greater foothold for the South Korean giant. So is it worth upgrading if you currently own a Galaxy Note 2? If you must have the latest and greatest with guaranteed future proof specs and better hardware, it is absolutely worth upgrading. If you are the average user who is content with your current offering, than maybe you are better off waiting. In either case, both phones provide a comprehensive and unique experience to the end user. As long as Samsung continues building on that success, everyone will remain content with their purchase. There are a number of mistakes in the article. Please proof read the article befor publishing it! English is not my primary language, however I'm doing my best to publish the articles without any mistakes. If there are any please leave another comment with these mistakes so that I can correct it. The article has been proof read four times before publishing, by individuals who are likely more grammatically savvy than you are. There are no mistakes, no less a "number" of them. You may want to "proof read" your post before publishing, as it's before, not 'befor'. When can we expect the release of firmware for Note3?